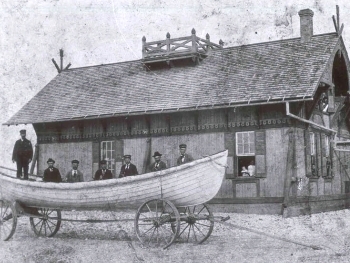 First “standard” version pulling surfboat adopted by the USLSS in the early 1870s, with design based on square-stern surf fishing boats then in common use along the coast of New Jersey. Versions of this model included the “Squan” and “Long Branch”. Neither self-righting nor self-bailing. Dimensions (varied by builder and model version): 25ft. to 27ft. overall length, 6.5 to 7ft. maximum beam, 2 to 2.5ft. depth amidships; 6 thwarts for a total of 10 oars rowed in double-banked configuration; most boats had no sailing rig; weight 954lbs. ; clinker built wood hull of cedar planks over oak frames with either copper or galvanized iron fasteners. 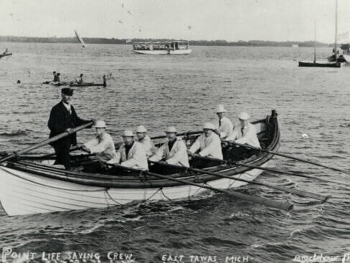 Two versions of the wooden Monomoy pulling surfboat were designed and built; one for use by coastal rescue stations (of 23 and 26 feet in length, all of which were clinker built), and one for use as a cutter boat (almost all of which were carvel built). Named for Monomoy Island off of Cape Cod, MA, from where the design originated. Neither self-righting nor self-bailing. The dimensions for the standard 26ft. 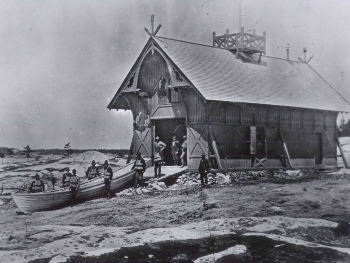 model assigned to lifesaving stations were: 26ft. 0in. to 26ft. 8in. overall length, 6ft. 8in. to 6ft. 9.5in. maximum beam, 2ft. 7in. depth amidships; 4 thwarts for up to 8 oars rowed in double-banked configuration; sprit sailing rig of jib and mainsail with centerboard; weight approximately 2100lbs. ; double-ended clinker built hull of cedar planking over oak frames with galvanized fasteners. Named for Race Point at the tip of Cape Cod, MA, from where the design originated. Neither self-righting nor self-bailing. Dimensions: 24ft. 6in. overall length, 6ft. 2in. maximum beam, 2ft. 4.5in. depth amidships; 5 thwarts for 5 oars rowed in single-banked configuration; some boats had a sprit sailing rig of a jib and mainsail with centerboard; weight 1000-1200lbs. ; nearly double-ended clinker built hull of cypress or cedar planks over oak frames, copper or galvanized iron fastened. Named for Frederick Beebe, the private boat builder who developed the design. Neither self-righting nor self-bailing. Dimensions: 27ft. 4in. overall length, 7ft. maximum beam, 2ft. 3in. depth amidships; 5 thwarts for up to 10 oars rowed in double-banked configuration; no sailing rig; nearly double-ended clinker built hull of white cedar planks over white oak frames. 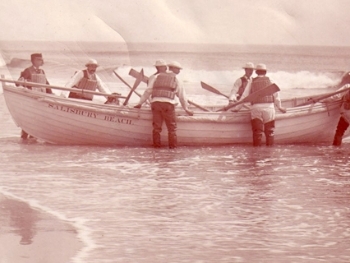 Designed by Lieutenant McLellan, USRM, and Frederick Beebe as the standard, beach-launched surfboat model to replace most if not all of the previous designs. 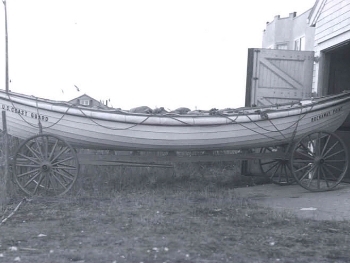 This design was a modification of the earlier Beebe pulling surfboat. Self-bailing, but not self-righting. Dimensions: 25ft. 4in. overall length, 7ft. 0in. greatest breadth, 2ft. 7in. depth amidships; weight approx. 1300lbs. ; 3 or 4 thwarts for up to 6 or 8 oars rowed in double-banked configuration; sprit sailing rig of single spruce mast with jib and spritsail; double-ended clinker built hull of white cedar planks over white oak frames with galvanized iron fasteners.